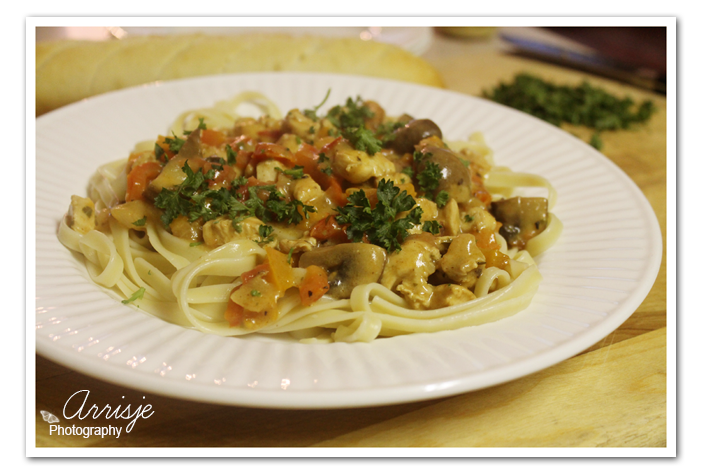 I found this recipe as a copy of T.G.I Friday Spicy Cajun Pasta. I made a few changes to it. Instead of adding garlic I added pesto and couldn’t resist to add some Alfredo Sauce. If you want to lower the calories use whole wheat fettuccine noodles and leave the Alfredo Sauce out. Melt 2 tbsp of butter in a large skillet over medium/high heat. 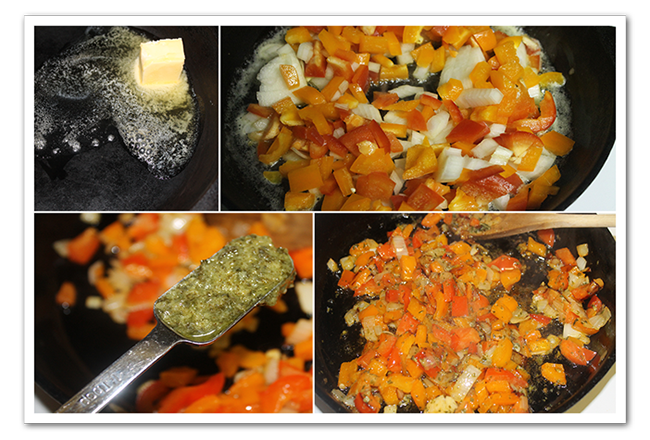 Saute the bell peppers, onions, in the butter for 8 to 10 minutes or until the vegetables begin to soften slightly. Add the 2 tbsp prepared pesto. 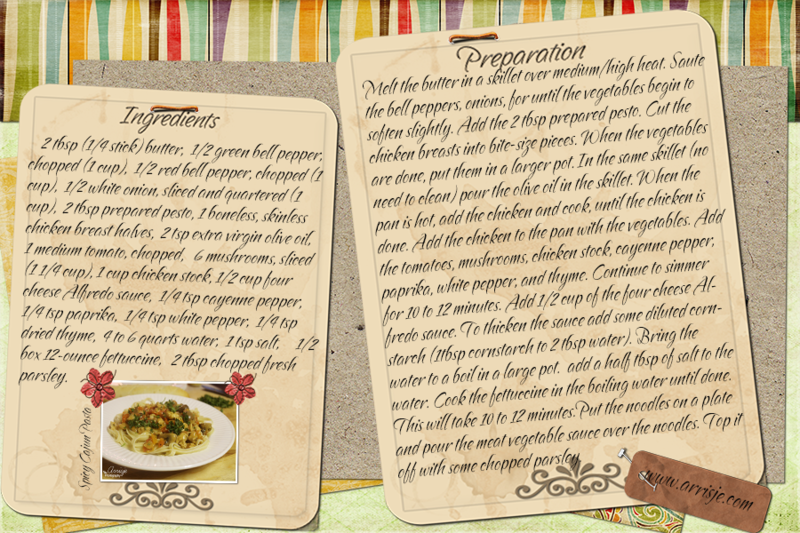 As the vegetables are cooking, cut the chicken breasts into bite-size pieces. When the vegetables are done, put them in a larger pot. In the same skillet (no need to clean) pour the olive oil in the skillet. 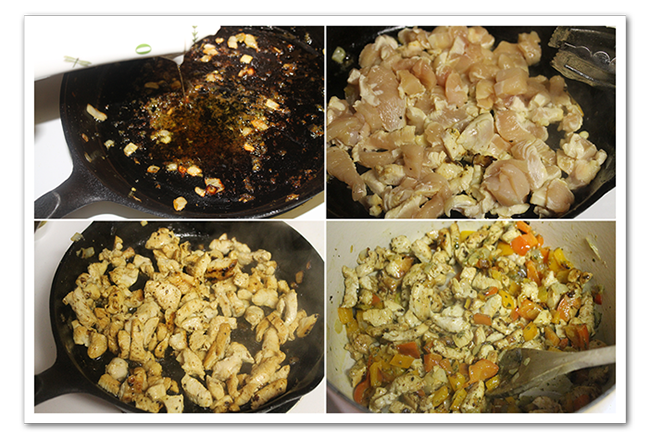 When the pan is hot, add the chicken and cook, stirring, for 5 to 7 minutes or until the chicken is done. Add the chicken to the pan with the vegetables. Add the tomatoes, mushrooms, chicken stock, cayenne pepper, paprika, white pepper, and thyme. Continue to simmer for 10 to 12 minutes. Add 1/2 cup of the four cheese Alfredo sauce. To thicken the sauce add some diluted cornstarch (1tbsp cornstarch to 2 tbsp water). In the meantime, bring the water to a boil in a large pot. If you like, add a half tbsp of salt to the water. 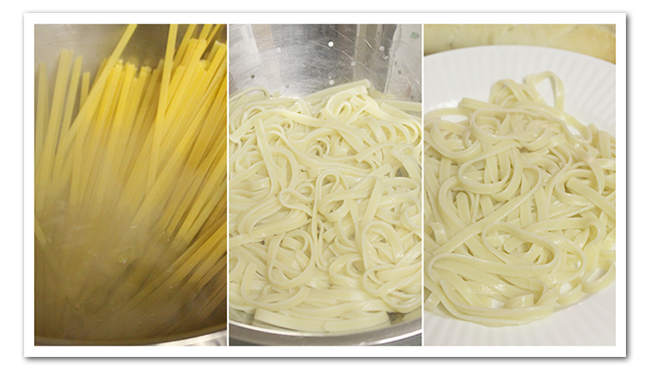 Cook the fettuccine in the boiling water until done. This will take 10 to 12 minutes. Put the noodles on a plate and pour the meat vegetable sauce over the noodles. Top it off with some chopped parsley. You can make this dish lower calories by using: chopped garlic instead of the prepared pesto, leave the four cheese Alfredo out, use whole grain wheat. 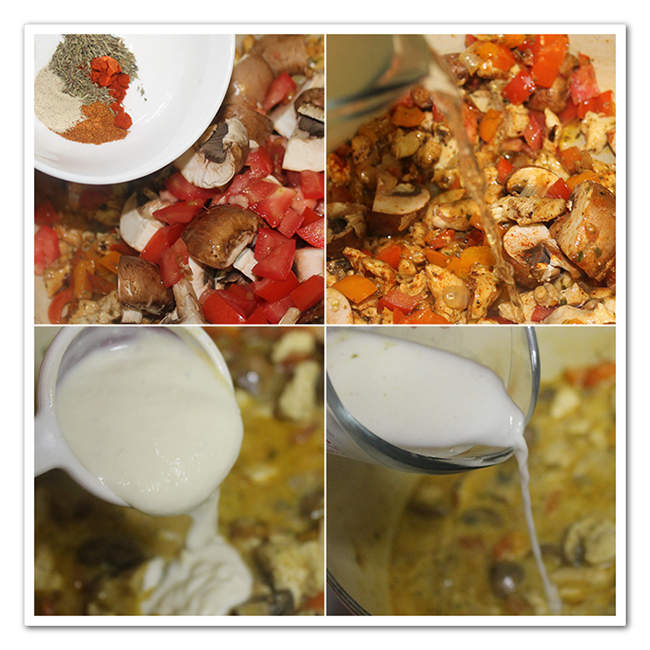 Add the tomatoes, mushrooms, chicken stock, cayenne pepper, paprika, white pepper, and thyme. Continue to simmer for 10 to 12 minutes. Add ½ cup of the four cheese Alfredo sauce. To thicken the sauce add some diluted cornstarch (1tbsp cornstarch to 2 tbsp water). chopped garlic instead of the prepared pesto, leave the four cheese Alfredo out, use whole grain wheat.